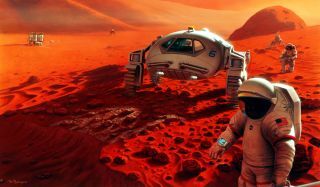 This artist's concept of a future Mars mission shows astronauts near a lander on the Red Planet. The moon may be more of a stumbling block than a stepping stone on humanity's path to the Red Planet, one prominent researcher says. The perceived need to develop lunar infrastructure and resources first could push a manned Mars mission far off into the future, said Harley Thronson, senior scientist for advanced concepts in the Astrophysics Science Division at NASA's Goddard Space Flight Center in Greenbelt, Md. "Only later was the elaborate national infrastructure established to support sustained development of the West," Thronson continued. "In contrast, widely popular 'moon first, then Mars' architectures are a reverse of the historical experience of human exploration on Earth." Discussions about how to send astronauts to Mars often center on "stepping stones" — for example, whether to go to a near-Earth asteroid or the moon first. But mission architects must keep in mind that focusing too much on intermediate destinations could significantly delay or doom a manned Mars effort, especially in this era of tight budgets, Thronson said. Indeed, the best approach may be to work toward heading straight to the Red Planet with a bare-bones mission. "Let's just go — prove that it is doable, prove that it is feasible and then examine how you do it on a regular basis that's affordable," Thronson told SPACE.com. The success of that first mission, however stripped-down it may be, would generate a great deal of excitement and momentum that would pave the way for future, more sustained Red Planet efforts, he added. The exploitation of lunar or asteroid resources could eventually play a large role in humanity's Red Planet plan, but it may be unwise to wait for this step. It could take hundreds of billions of dollars and many decades to build up enough infrastructure to make a difference, Thronson said. Thronson said his thinking on this issue has been influenced by Inspiration Mars, a private mission that aims to launch two astronauts on a Red Planet flyby in 2018. "They have obviously adopted the philosophy of, 'Let's just do it,'" he said. The Space Review piece is meant to stimulate productive discussion and debate about the future of human spaceflight, Thronson said. And it may also help scientists, engineers and policymakers view the term "stepping stone" in a new light. "Stepping stones don't have to be measured by distance; they could be measured by capabilities," Thronson said. "The successful space station program is stepping stone number one," he added. "Going to Mars in a minimal or reduced-capabilities mission is stepping stone two. And then setting up the support system for subsequent missions to Mars — say, on the moon — is stepping stone three." Humans haven't been on the moon, or anywhere else in deep space, since NASA's Apollo 17 mission returned to Earth in 1972. NASA is currently working to get astronauts to a near-Earth asteroid by 2025, then on to the vicinity of Mars by the mid-2030s, as directed by President Barack Obama in 2010.